Airlines operating flights to Basel from the UK include Ryanair, easyJet, British Airways and Air Berlin. From London - 1 hour 35 minutes; New York - 9 hours 30 minutes (including stopover); Los Angeles - 13 hours (including stopover); Toronto - 10 hours (including stopover); Sydney - 24 hours (including stopovers). Basel is an important European motorway junction with direct road connections to the rest of Switzerland and to France and Germany. If you drive into Basel, make sure you have a valid vignette (toll sticker) if you drive on the Autobahn. The vignette is valid for the calendar year indicated on the sticker. If you do not buy one and are caught without one, expect to pay a fine plus the cost of a vignette. You can order one online before you travel (rail.myswitzerland.com/vignette.html). Traffic drives on the right in Switzerland and the minimum driving age is 18. Visitors can drive in Switzerland using a national or international driving licence for up to a year. The maximum speed limits are 120kph (75mph) on motorways, 100kph (62mph) on dual carriageways, 80kph (50mph) on main roads, and 50kph (31mph) in towns. There are two motoring associations in Switzerland. These are Touring Club Suisse (TCS) (tel: +41 844 888 111; www.tcs.ch) and Automobil Club der Schweiz (ACS) (tel: +41 31 328 3111; www.acs.ch). A Green Card is not compulsory, but check with your provider that your insurance covers you for travel within Switzerland. TCS (tel: 0800 140 140, in Switzerland) or ACS (tel: +41 44 628 8899). Among the major motorways connecting with Basel, the A1 heads southwest to Bern, the A2 leads south to Lucerne, the A3 east to Zurich, the A35 northwest towards Mulhouse in France and the A5 north towards Freiburg in Germany. Eurolines (tel: +41 844 257 244; eurolines.ch/fr/) runs coach services to Basel, connecting the city with destinations across Europe. From Zurich - 1 hour; Geneva - 2 hours 40 minutes; Bern - 1 hour 5 minutes; Strasbourg - 1 hour 10 minutes. Switzerland has the most efficient railway network in the world, with plenty of intercity trains. Basel has three railway stations, linking the city with the rest of Switzerland and all parts of Europe. The Basel SBB and Saint Louis SNCF stations are located next to each other in the city centre south of the Rhine and serve trains to and from destinations in Switzerland and France respectively. The DB station, called Basel Badischer Bahnhof, lies north of the river and primarily serves destinations in Germany. The easiest way to move from the Swiss and French stations to the German station is to take tram 2. SBB (tel: +41 900 300 300; www.sbb.ch) runs frequent services to Basel from Zurich, Bern and Geneva. Slower regional trains connect with most major Swiss cities. Deutsche Bahn (DB Bahn) (tel: +41 61 205 9494; www.bahn.de) runs high-speed ICE trains from Berlin via Frankfurt, which itself has plenty of trains heading for Basel. SNCF (tel: +33 892 353 535, in France; www.sncf.com) operates high-speed TGV trains from Paris. You can reach Basel from most other major French cities with a simple change in Mulhouse which is connected by frequent regional trains. The quickest way to get to Basel by train from the UK is to take the Eurostar from London to Paris and the TGV from Paris to Basel (you need to change stations in Paris). Basel is also a hub for night trains; there are nightly services from Berlin, Hamburg and Zürich with Nightjet-trains (www.oebb.at/de/angebote-ermaessigungen/nightjet). From Zurich - 53 minutes; Bern - 56 minutes; Geneva - 2 hours 40 minutes; Berlin - 7 hours 15 minutes; Brussels - 7 hours; Milan - 4 hours. 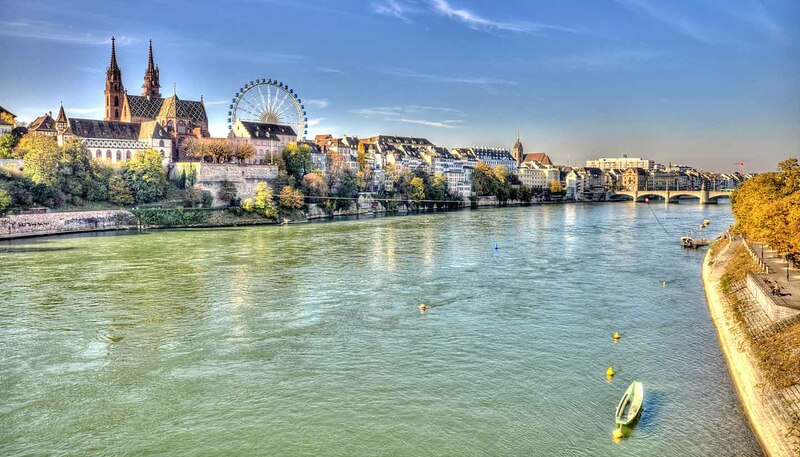 The Rhine is navigable in the summer and a number of different cruise ships ply the river and make stops in Basel. Viking River Cruises (tel: +44 800 319 6660, in the UK; www.vikingrivercruises.co.uk) offers an eight-day Rhine Discovery cruise with departures from Amsterdam which end in Basel.